"Pour some out for Myspace. Never before or since has there been such a unified platform for fans to connect to their favorite artists. You didn’t “like” Dashboard Confessional. The two of you were friends. In one spot, you could look at pictures of Chris Carabba, read the tour blog, stream the songs, find the dates, leave your fanmail—you name it. When Tom and the gang fell behind in the social race, Facebook successfully jockeyed for the top social spot, but was slow to adapt to the segment of music marketing that their predecessor had cornered so adroitly. It never felt as personal. Third party plugin apps confused us. And even though Myspace was on its last legs back in ’09, it feels like Facebook still hasn’t caught up. Certain bands are more active on Twitter or Instagram, or else funnel the bulk of their resources into apps, email campaigns, or good old-fashioned websites. Bands’ pages can be tough to find, navigate, or engage. But for all its problems, we’re stuck with the ‘book' for the foreseeable future—for better or worse. There are ways, however, to put Facebook to use—especially for the touring artist. Facebook’s Event interface is increasingly useful for social engagement and event promotion. Here are four practical steps to draw more heads to your show using event pages. 1. 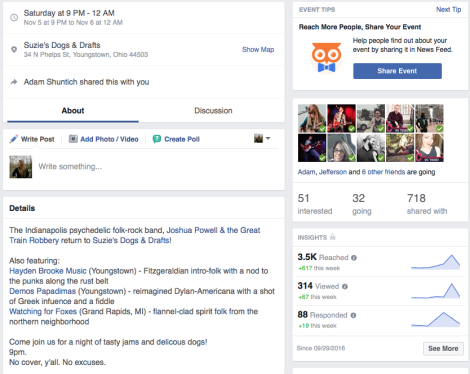 Treat your event page like its own tiny website. Services like Squarespace and WordPress have stripped web design down to basic building blocks that even the least technically savvy folks can create a website for their personal professional presence, their book release, their wedding. A Facebook event page should be treated the same way—as an easily navigable hub for pertinent details. An event page does not dissolve after the event has passed. They’re just filed away, unlike a traditional site with its own domain name that requires annual fees to remain registered. Each event page features one photo that acts not only as a header, but also as a thumbnail when that event is posted in your feed. Take advantage of this by using custom photos for each event so that they are easily differentiated. Be certain to use the location tag services accurately so that fans can link to the map on their phone and end up in the right club. Include doors, show time, age restrictions, and cost. Use the available search key words by tagging the city and the genre of the show. – Music Video Release Show! All of these are more intriguing than “Jonny Carroll at Lantern Coffee”. Specificity is evocative. Giving each concert a sense of singularity is vastly more engaging than a cut-and-paste series of identical events with a different city name in each. Listings like this become white noise in a feed filled with the infinite variety of user-sourced content that is refreshed by the minute. 2. Build an event-specific team. If you’re touring, you’re likely not the only band on the bill. Involving the other bands and promoters will exponentially expand your reach. Use the @ tagging feature to link directly to the other bands’ Facebook pages when you include them in the description. This allows interested parties to easily do their homework on the lineup. Give each band a few lines: list their hometown, their genre, and either a pithy description of their music (“Shoegazey gloom from beneath 10,000 leagues of curated reverb”) or a press quote (“This heartland trio is a storming folk-rock outfit bred for the tavern.” -Willamette Week). Ask each group to appoint a representative for the event page. Using your personal Facebook page, become friends with these reps. This allows you to add them as co-hosts. Also extend the offer to the talent buyer or show promoter—they may have specific knowledge of interested parties among their regular crowd. Not only does this provide a support team for fans requesting details about set times, age restrictions, etc., but it creates a home base for the bands themselves to be on the same page (pun intended) concerning DOS information. Having these personal contacts in your social network also makes it easier to reconnect with the event reps on your next run through that city. As a rule, people often reply more quickly to a personal message than one that is sent through an official Facebook Page. Forget the name of some people you met at the show? Refer to the “went” guest list—a simple way to keep track of contacts. Encourage the other event reps to perform the same search/invite function. Then engage the invitees. Post in the event discussion as plans develop. Link to Soundcloud tracks, music videos, and press write-ups for your band and the others. Remember that online, any media is more likely to engage than a text post. Have you played this city before? Dredge up the old Facebook event for that show and post a link to the upcoming show with a few welcoming words. “Hey Columbus! We’re coming back to you! Catch us next month at Woodlands Tavern!” Your event photo will appear in the past event’s discussion and everyone on the old guest list will be notified of the post—another opportunity to ping their inundated radar. 4. Be persistent and consistent. People check their phones incessantly. Do not shy away from being persistent. You might have posted the link ten times, but any one of your friends likely only saw it once—especially with Facebook’s infuriating algorithms that de-prioritize Page posts, designed to bully Page managers into buying ads. Incidentally, this is also a contributing factor to the failure of many a crowdfunding campaign. What’s the worst that can happen? Maybe a friend unfollows you in their feed; this was likely not a potential concert-goer anyhow. Use common sense here. Remember that you can post too much. Having different band members or fans share the link on your behalf will not only take the burden of promotion off your back, but will also reach a different sphere of influence with each posting user. Word of mouth is always the most effective form of marketing. Post your polished event on the wall of the venue with a note of excited anticipation. A share from a venue will, again, multiply your reach. The more a user sees a show cropping up in their feed, the more likely they are to see it as a significant event. 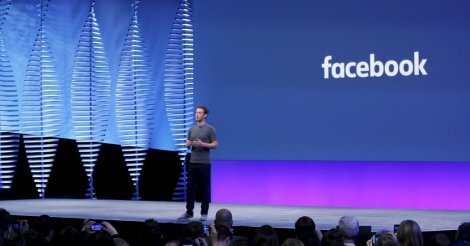 Is Facebook the perfect platform for connecting artists and fans? No. But by building a working knowledge of its nuances, we can utilize the imperfect medium to its maximum potential. Treat your shows like events. Treat event pages like websites. Involve the whole team. Don’t be above reaching out to individual fans and friends. And don’t worry about cluttering your fan’s feeds—they follow you for a reason. Get them out to your show and keep it that way."